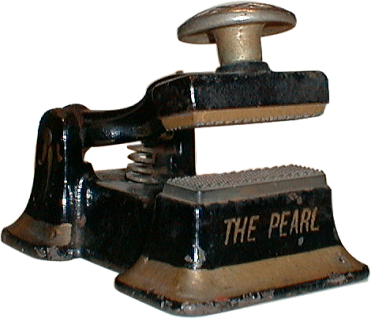 Called “The Pearl,” this stamp most likely does not have any relation to the popular presses of the same name made by William Golding (see Pearl OS No.1). This small stamp operates in much the same way as does a waffle iron, imprinting a honeycomb-pattern into a piece of paper. It may have been used on handwriting (such as a signature or dollar amount), for the purpose of making the writing difficult to alter after being stamped.